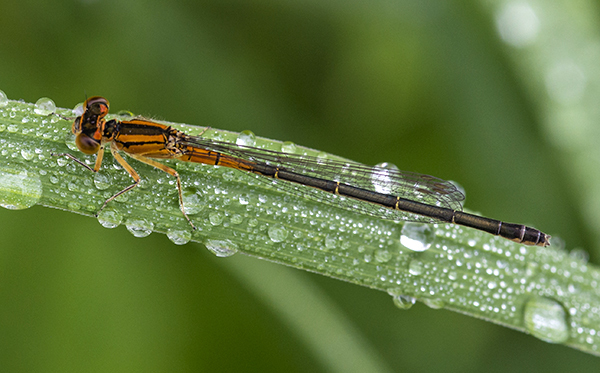 The Chicago Botanic Garden is a great place to find damselflies. You can find them in every location here, and different locations will often yield different species. For example, you might find stream bluets along the river and orange bluets hanging out on the lily pads. Most species measure about an inch in length and can be easily overlooked, but when you take time to slow down and search for these tiny gems, you will be rewarded with finding some of nature’s most beautiful hunters. Indeed, these tiny insects are fierce hunters—but don’t worry, as they neither bite nor sting humans. Their preferred food choice is other, smaller insects (including mosquitoes). 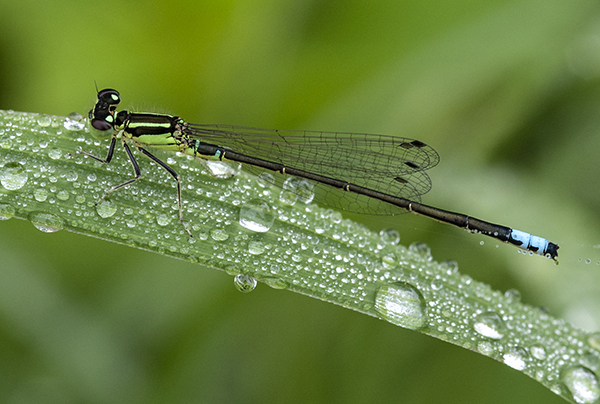 The main differences between dragonflies and damselflies are their size and wing positions. 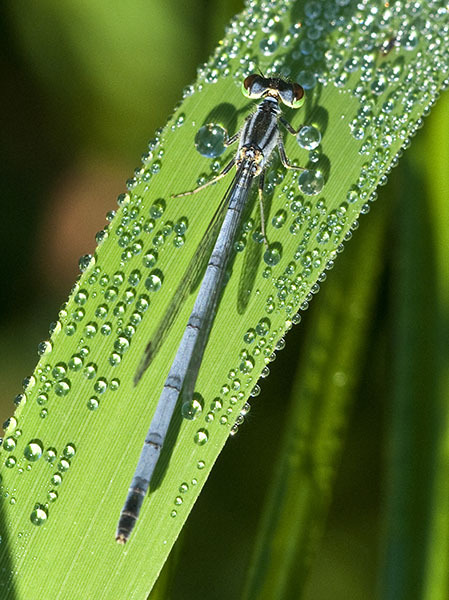 Damselflies, in general, are smaller, and hold their wings over their abdomens. Dragonflies tend to be larger, with a heavier body, and hold their wings out to the side. 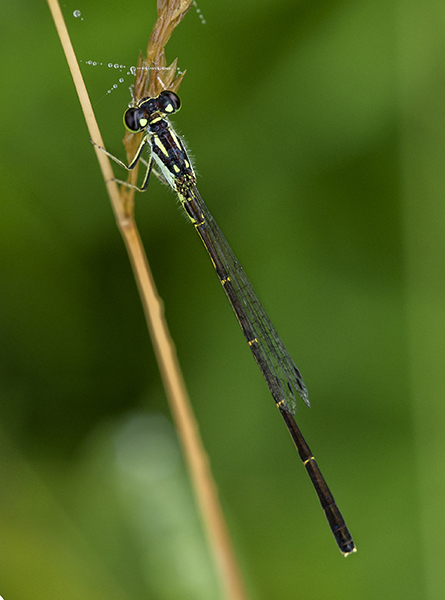 The most common species around here is the eastern forktail damselfly. Identifying them can be tricky, as they come in several different varieties! The males and females look very different from each other, and the females change color as they age. I like to get out early in the morning. The light is low, there is often dew, and the insects move a bit more slowly until they warm up. 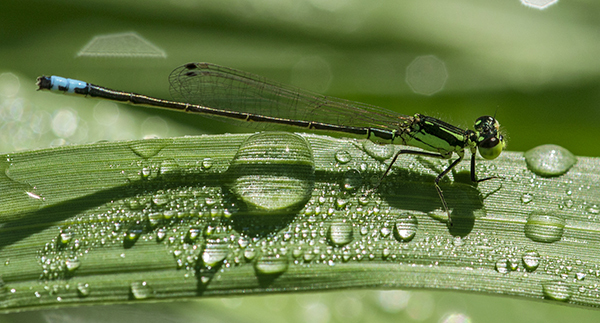 One of my favorite places in the Garden to photograph damselflies is in the Dixon Prairie. They like to hang out on the grasses there. Walking slowly on the path next to the plants, you will see what look like tiny flying sticks. 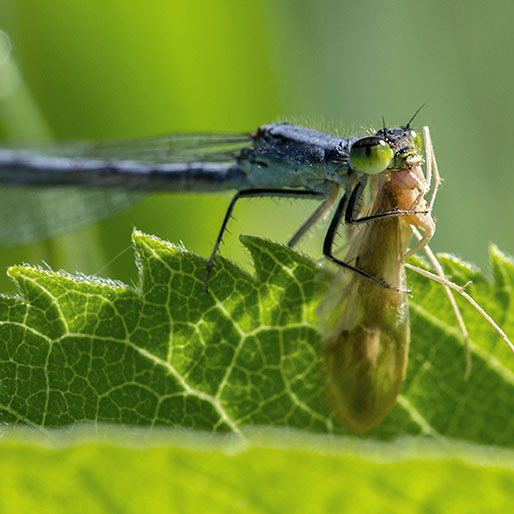 Damselflies will often congregate in one area and, if disturbed, sometimes land just a short distance away. I like to use my 105mm or 200mm macro lenses to photograph these beauties. They will fly until the first really hard frost. There are dozens of species native to this area—all of them beautiful and fierce hunters.